Like a human baby, a kitten has different requirements and needs as it grows. It is important to meet these needs to ensure your kitten grows into a healthy well-adjusted cat. To help with your new kitten, here is our Crazy Cat Lady Guide to Kitten Care! When Are Kittens Ready To Leave Their Mother? Help Your Kitty Get Smart! Before you bring your new kitten home you will need to kitten-proof her living space. Put away anything that can break or be hazardous to your cat. Like a teething puppy, kittens will want to sink their teeth into everything that is around them including string, ribbon, rubber bands, electrical cords and poisonous plants. They also tend to seek out small dark spaces like the dishwasher or clothes dryer, air vents, and cupboards. Because of this, you'll want to make sure you place safety latches on any item you do not want a kitten to open, get into, or get lost in. Fishing your kitten out of the deepest darkest recesses of your kitchen cabinets is no fun! Keep your kitten in a small safe contained area when not under supervision. Typically a large cat carrier, bathroom or laundry room work well. The goal is not to cramp your kitten in a small carrier, but to put her in a safe place where she can't get hurt in your absence. Just remember to keep the cabinets latched tight if she's going to roam the house without you. ​Use your common sense when it comes to how much precaution you need to take with your kitten. 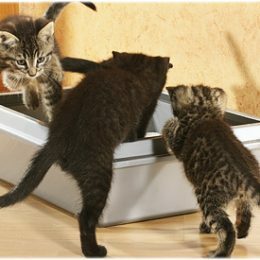 Older, larger kittens will need less direct supervision and containment than a newly weened kitten. 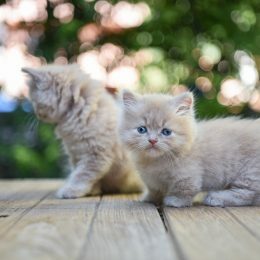 Also, you'll want to take more precautions with a kitten that is just being introduced into your home versus a kitten that has been in the house for a few weeks and acclimated. Are there small children in your home? Consider a safe place for your kitten to decompress from all the action. Are there other pets in your home such as dogs or cats? Just like having small children, consider a safe place for your kitten to get away from the attention and have some personal space. Do you have plants in the house? Here is a list of plants that are poisonous to cats. Consider putting them in an area the kitten or any cats in the home can't get to them. Kittens under 8 weeks should really still be with their mom. You should not adopt a kitten under 8 weeks as they are still developing their leg coordination and vision. Special attention will be required if you find yourself taking care of an orphaned kitten under 8 weeks old. Kittens who have been orphaned will need to be bottle fed every couple hours from birth to 4 weeks old. It is best to use a formula prepared for young kittens such as KM﻿﻿﻿﻿R (Kitten Milk Replacement) versus feeding them milk or cream. This will ensure they get the right amount of vitamins, minerals and fats to grow into a healthy cat. There is much more to making sure a very young kitten is properly cared for. In addition to taking your kitten to the vet to make sure she's healthy, you'll want to make sure she's kept warm and you keep her clean. Very young kittens don't know how to pee and poop on their own and will need your stimulation to help them get started. It's not as gross as it sounds! Check out this resource on very young kitten care. Here is an easy kitten feeding guide for the first six months. If you started out with a very young kitten that needed to be bottle fed, you can start to move them to solid food in about 3-4 weeks. When they start biting on the bottle, you'll know it's time to move them to the next stage. At two to four months old you kitten will grow very quickly. Their energy level will be off the charts. It is important to select a food made for kittens that is high in protein with meat as the first ingredient. It should be easy to digest and suitable to an active young feline. Do not feel you have to leave kibble out for your kitten all the time. This can lead to obesity. Regulated feeding works just fine. You will need to feed them 3-4 times a day to keep up with the calories expended during this active period. Choose your food wisely as too little protein can do harm. Look for a food that is at least 30% protein, 20% fat and fairly low in carbohydrates. Cats, by nature, are free-roaming. If left unstimulated, they can develop behavioral problems from boredom. Also, an inactive cat is more prone to becoming obese and developing other health problems. Solving a puzzle is an easy way to not only satisfy a cat's innate curiosity but it also mimics a cat's hunting behavior in the wild. Click here to learn more about interactive cat toys. As your kitten gets reaches adolescence, he'll treating the door outside as a personal challenge. An outside cat faces many dangers. From predators to being hit by a car, not to mention being exposed to disease and fighting with other cats, it's a dangerous world for an outside cat. This doesn't mean your kitten has to spend his life indoors. There are many outdoor enclosures that can give your kitty a taste of outside without exposing him to the danger. Several companies make enclosures that come in modules so you can custom fit any area from a small apartment patio to a multi-story backyard beast. This chalet features 2 rooms and a loft for your cat to chill outside while remaining protected from predators and other outside dangers. This enclosure actually mounts outside a window and your kitty can come and go via a pet door in the window. What's nice is it also includes a litter box. One note - you would want an enclosure like this to be well covered by your roof or overhang if you use the litter box outside. A kitty box full of rain is no bueno for you or your cat. That said, this is a pretty cool enclosure that is sure to give your kitten lots of nature watching pleasure! This pop-up mesh tent is great for a patio. It pops up easily and gives your kitty 30 square feet of play space. You'll want this tent to be under a shady place as it doesn't have any way to break up direct sunlight. Quality of commercial cat enclosures can really vary, so be sure to do some research before purchasing one. Also note, this is not supposed to be a permanent home for your cat. This is a way for him to get safe exposure to the outdoors with the ability to still come back inside. Clawing is totally natural behavior for cats. They use it to mark their territory, sharpen their claws, and keep their front legs stretched and ready for hunting. Offering your kitten attractive alternatives to the furniture will go a long way towards saving the side of your couch. Cats are individual in their scratching surface preferences. Some will like the texture of corrugated cardboard while others may prefer wood or sisal. It may take a little trial and error to find what she really likes. Experts agree all cats need a sturdy cat tree and then add some scratching items based on your cat's preferences. 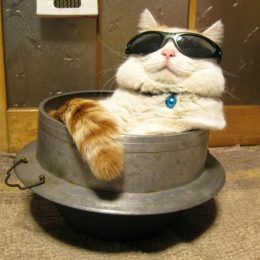 You can add some catnip to both items to give your kitten some extra incentive to use them instead of the furniture. You can also provide positive reinforcement by giving your kitten a small treat when he uses the scratch pad. 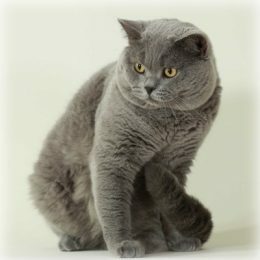 As mentioned above, scratching and clawing is natural behavior for cats. Some people believe the solution to this is by declawing. We can't say enough this is NOT a humane answer to your cat's habit. Removing your cat's claws is the equivalent of amputating your fingers at the first knuckle (where the fingernail is). Declawing causes extreme pain for your kitty and can lead to health problems down the road because it completely alters his gait. Don't do it! Take the time and help your kitten get used to alternatives like scratch posts and pads. Remember - just putting it out there and expecting kitty to naturally use it generally isn't going to cut it. You'll need to introduce the new behavior then positively reinforce it. Cats need toys to stimulate their minds and help them develop. Food puzzles provide a way for a kitty to "hunt" for his food. This makes him more confident and well-rounded. A well rounded cat tends to be less destructive and runs a smaller chance of developing negative behaviors. Interactive toys can range from laser pointers to "things" on a stick. Many interactive cat toys will require your participation which is good bonding time for you and kitty. However, you can find some toys like FroliCat where you turn it on and your kitty does the rest. As your kitten grows it is important to socialize him. This will determine how she will react to strangers and other pets. It is important to expose them to as many sights and sounds as possible. Play sounds of dogs barking, fireworks, music, and babies crying. Make sure your kitten is receiving positive reinforcement during this time with treats, pats, or playtime. You know what noises are frequent in your household. If there are never any dogs in your home, but lots of small children then expose your kitten accordingly. Patience and moderation is the key here. You don't want to over-expose your cat and give her a complete case of the nerves. A little at a time can go a long way to a more balanced, stable cat. Bear in mind, some breeds are more naturally nervous than others. One note on the above video. He talks about cutting his kittens claws. Before you cut any cat's claws, it's important to know how to do it correctly. Here is an article that will show you how. You kitten should also get used to basic grooming techniques early in life. 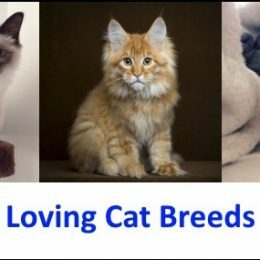 These include a combing, especially for long haired cats, ear cleaning and bathing. Try to brush your kitten with a steel comb or slicker brush at least weekly if not more often until they are used to the process. Get them used to having their ears manipulated so you can check for dirt. Any surface dirt can be wiped off with a cotton ball. Try to bathe your kitten every few weeks whether they need it or not so they will adjust to the sensation. You do not need to use a kitten shampoo all the time. Just getting them used to the process of wetting down, scrubbing their fur and drying them off is all that is needed. Teeth often get overlooked. It is important to brush your kitten’s teeth at least one a week if not daily. You want to get your kitten used to this at a young age. It can be very traumatic as an adult and even more so if you cat needs to be put under anesthesia to have their teeth cleaned. Check a stool sample for worms. If possible provide a stool sample to your veterinarian. The doctor will check the stool sample for any worm infestation that can be fatal to your cat if gone undetected. This is an important step as some worms can be transmitted to humans. Check for fleas and ticks and discuss parasite prevention. You can treat your kitten for fleas as early as 8-12 weeks old. Listen to your kitten's heart and lungs for any abnormalities. Check eyes ears and teeth to ensure there are no issues. Give you cat their vaccinations and set up a vaccination schedule. Discuss heartworm prevention. While not as common in cats it can be fatal. Test for feline lukemia if you adopted a kitten from a shelter, rescue or found your kitten outdoors. Feline lukemia is easily communicated between cats. Keep your kitten isolated from other cats in your household until tested to prevent infection. Your veterinarian will set up a vaccination schedule and discuss a time to spay or neuter your kitten. In addition this is a great time to socialize your cat with the doctor’s office and the staff. Plan on taking your cat to the veterinarian for yearly checkups at minimum. An exam can nip potential health problems in the bud before they can lead to expensive and painful treatments for your pet. If your cat is outdoors this is especially important so the vet can check for parasites as these can be transmitted through cat feces. And always take your cat to the vet if they seem to be “acting funny” or are suffering from hair loss, loss of appetite, lethargy, diarrhea, excessive vomiting or any other behavior that is not deemed typical behavior for you kitten. Should Your Kitten Be An Outdoor Cat? Many people believe they are depriving their cat of their natural feline predatory behavior if not allowed outdoors. However, that behavior is just as easy to feed indoors with the appropriate toys, large cat trees, and safe outdoor enclosures. The outdoors is a dangerous place for cats. Raccoons, feral cats and other wildlife can transfer diseases through direct exposure of their urine and feces. Cats can be harmed by predatory animals like dogs, coyotes, eagles or other larger cats. And of course danger from cars and other urban hazards can maim or kill your cat . Rain, wind, snow and hail can trap a cat or cause ill-fated exposure. Dangerous plants, anti-freeze puddles and prey, like toads, can all poison your cat. 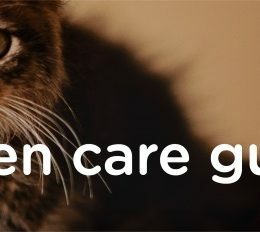 If you do insist on allowing your cat to go outside be sure they are spayed or neutered, are not declawed and are up to date on all their vaccinations. In addition keep a breakaway collar on them with identity tags or have them microchipped. While a kitten can be lot of fun, very cute and quite loving they are a great responsibility. A kitten turns into a cat that could be in your life for the next 13-20 years. You must be prepared to love, pamper and care for your feline friend throughout their life. If you do so, your love and affection will be returned a hundred fold. To help you prepare for your new kitten here is a ﻿﻿checklist of items to purchase﻿﻿ and things to do. Why Does Litter Go Flying When Your Cat Uses The Litter Box? Why Do Cats Kick Their Back Legs? Cat trees for large cats are built differently from other weaker kitty condos. 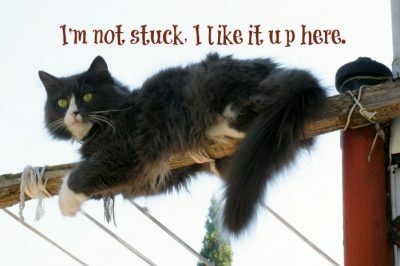 Check out this guide to find the best cat tree for your plus size kitty! 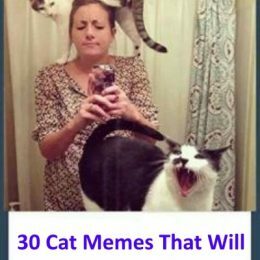 These 30 Cat Memes Will Make Your Day! 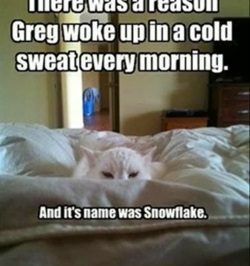 Add a kitty inspired giggle to your day. You need it! 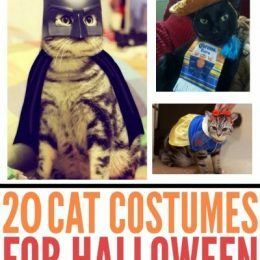 Halloween is the perfect time to dress your kitty up and remind him there are consequences to shredding the couch at 2 in the morning! 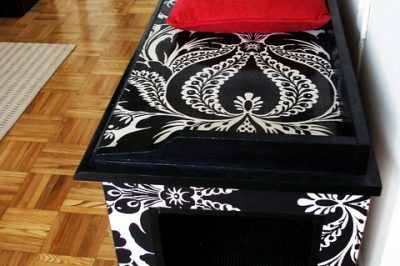 8 cool DIY designs for cat litter box furniture you can make. 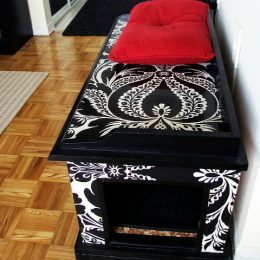 If you like to make things yourself and want to improve your cat’s litter area, check this out! © Crazy Cat Lady Supplies.